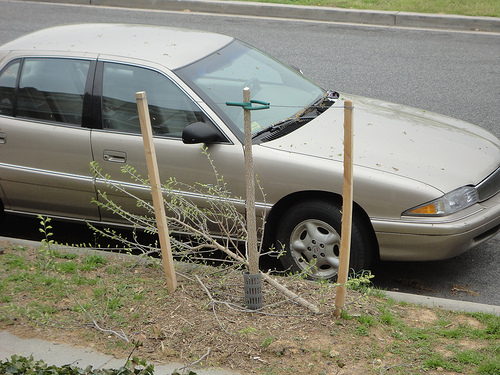 PoPville » Dear PoP – My Neighbor’s Adult Son Killed a Tree, What Do I Do Now? Dear PoP – My Neighbor’s Adult Son Killed a Tree, What Do I Do Now? I’ve got a bit of a neighbor dilemma, and am hoping your readers should shed some light on the situation. I live next to two elderly ladies — we have a cordial relationship that I would like to maintain. Their son (let’s call him Sam) visits every couple of weeks and tends to things around the house. We also have a good relationship. Last year when the city went around and planted trees, a tree was placed in the tree box in front of their house. A few weeks later, I noticed the top of the tree had been cut off (effectively killing it.) Another one of my neighbors (no longer lives on the block) mentioned Sam had killed the tree. I was perhaps a bit peeved, but no big deal I suppose. It’s very rare that I’m speechless after receiving an email – but I am stone cold speechless. I am genuinely eager to see what others think because quite frankly I’m unable to give helpful advice that is not skewed by the emotions I have after seeing the above photo. For those who give advice – obviously there is an emotional reaction – but try to keep in mind that the reader needs to maintain neighborly relations. Keeping that in mind – what would you do in this situation?